I've been away for a while hence explaining the blog silence. While away, I bought Jordan a night shirt with the words "I love sleepovers". She was chuffed because in a nutshell, she does. Once I had gotten over the jetlag, she set about bugging me for one. And if anything, that girl is persistent so we caved. She invited some of her best friends and my head spun as I wrapped my head around the idea of 3 more girls in our house. I'm happy to announce that post play date, my house is still standing and my sons haven't run away for good. But here are some things I learnt from it. 1. Sleepovers are a misnomer. There was no sleep to be had. For them and for the rest of the household. They were too excited and they spent all their time nattering. There were multiple toilet jaunts and declarations of one girl having fallen asleep but being woken up by the other 3 in one way or the other. No amount of warnings or threats, on the part of our exhausted helper, of "I will wake Jordan's Mommy and tell her you all are still not sleeping!" did anything to quell them. I walked in on them at 1 am to someone in a handstand on the bed in the dark. Eventually, they might have ended up with about 4 hours of sleep not that anyone can confirm it because they outlasted everyone else in the household. They knew this for themselves. All complained that they hadn't slept much though it didn't deter them from anything. 2. Noise and Number of children; not an incremental correlation. Packrat had the 4 girls in the car and by the time he got home, he was a little bit on the deaf side. He was also sure that before the end of the night, one of our neighbours would have called the police on us. He said his ears were ringing from the high pitch chattering, squealing and giggling of the 4 girls. His exact description was that they were like Gremlins, fed after midnight and then sprayed with water. They laughed at everything and they were plotting against the boys.The most repeated phrase of the night was "Ssssh, I can hear you girls through 3 closed doors!" And even their whispering was loud. But when one left after lunch the next day, the noise level dropped massively. So our conclusion was the increase in volume rose exponentially with the number of girls. 3. Household chores are fun too. With 6 kids in the house, the probability of mess was going to be a high one. So in order to keep all our sanity, we declared that they have to make their own bed, clear up their own clothes, bags, towels, soft toys and clear the table after lunch. Any mess that they made, they had to clear up or Jordan would find herself very short of toys by the end of the play date. It worked. Everything was fun because they did it together. It was probably the only reason why the house was still standing by the end of the day. One of them declared that it was like going to camp but the bed was comfortable and there was air-conditioning. Jordan opened her mouth to suggest creating an adventure camp but one look from myself and the helper told her that it was as wishful as her desire for wanting a puppy. To give our helper time and space to actually clean the house and to prepare lunch, also to restore some of her hearing, I took them all out. 6 children squished into the car and all the way to the park where they could run wild. And run wild they did. It was the most peaceful three hours I had with them because they created their own games including the boys and run amok in the open space. They ran, they crossed stones, they sat on the swings, they threw a frisbee around and they made up games. By the time I got them home, they had expended much of their energy, bouncing off the walls much less and deigned to play quietly after lunch. Eventually I shipped the two boys off to Evan's friend's house for their own play date. Even though there were two of them, they really didn't stand a chance against the girls. They were laughed at, teased, excluded (on account of their being boys), made to play the monster/ enemy/ bad guys (on account of their being boys) and locked out of the room (on account of their being boys). It was going to end up in tears (on the boys' part) at some point so I thought it would be better if they went off to safer waters. And it helped. The boys were happy, the girls knew no better but I had a much more peaceful time because I didn't have to mediate the boys' whining about being left out, teased, locked out etc. 6. As little sugar or chocolate as possible. Even with minimal help, the girls were on such a high; talking loudly, laughing loudly and giggling at every.single.thing. If we had given them more sugar or chocolate, I think the house would have truly fallen down. By the end of it, Jordan was exhausted. But apparently, the girls all went home talking about their "camp' non stop so I'm assuming they all had a great time as well. Despite making it sound like it was exhausting, it was really fun to watch the girls play, squabble, make up and natter. It made me hope that for Jordan's sake, she stays close to these friends of hers. And the boys, being boys, came home asking where all the girls were and were genuinely saddened that they weren't around. 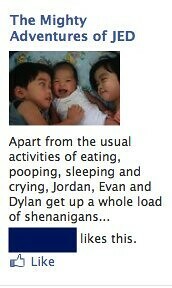 Jordan's already asking me when they can do another sleepover. But it's like jet-lag. It takes a while to recover from. So I'm going to tell her to ask me in a year's time.